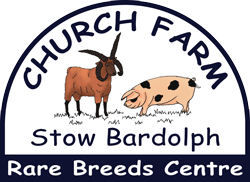 Church Farm, Stow Bardolph is an RBST Farm Park near Downham Market in West Norfolk. Rare and interesting breeds of sheep, pigs, goats, horses and other small animals are kept and shown to the public. We have approx. 50,000 visitors a year, including many local playgroups and primary schools. There 8 staff members working in the livestock area, who are friendly, fun and enthusiastic about Church Farm with lots of ideas for the future. We are looking for a permanent Farm Livestock Assistant for 5 days a week from 7.30am – 5pm (43.75 hours a week). The normal working days would be Monday, Wednesday, Thursday, Friday & Sunday. Remuneration is up to £8.21 per hour (£18677.75 p.a.) depending on age & experience. All applicants MUST be able to show proven experience of working with livestock. Participate in friendly, informed interaction with all our visitors to include pre-schools, primary schools, seniors etc. Other duties would include, helping with general ground maintenance, fencing, hay making, straw carting and day to day repairs. The ability to drive a tractor would be an advantage. They must hold a current clean driving licence and be flexible with their working hours, due to the nature of the job. Stow Estate Trust offers a company pension scheme, and an employee paid health care scheme. We are looking to fill this position as soon as possible so the closing date is 30th April, but we may interview before this if we find suitable candidates.